Swimming Beast in the Cavern is the first mission of Hazy Maze Cave in Super Mario 64 and Super Mario 64 DS. The mission involves using Dorrie to collect the Power Star in the underground cavern. Taking the left path from the start of the level, the player has to pass the rolling boulders, go down the elevator behind the door, and then go down the ramp and into the water. The player will find Dorrie swimming around in the cavern. 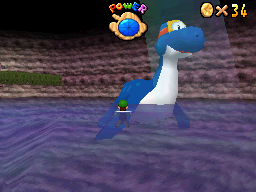 In Super Mario 64, the island in the center of the lake is raised, so the player has to use Dorrie to reach the top and collect the Power Star. Ground Pounding Dorrie's back will lower her head and allow Mario to stand on it, making Dorrie raise Mario up high. By having Mario turn in the direct the player wants to go, Dorrie will move in the direction Mario is facing. In Super Mario 64 DS, the island is easily accessible, but a large boulder blocks the Power Star. If the player isn't already playing as Wario, they will need to collect his cap that Dorrie is wearing. 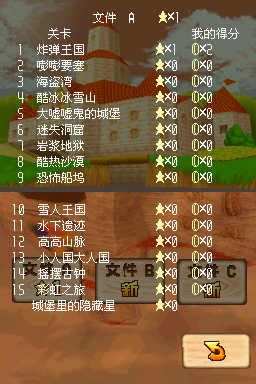 Ground Pounding Dorrie's back will allow the player to reach Wario's Cap. On the small island, Wario needs to simply punch the boulder for the Power Star to appear. This page was last edited on October 23, 2018, at 22:22.